At a Jan 6 neighbourhood meeting, Police Inspector Heinz Kuck from 51 Division talked about graffiti. Of the 7 major categories of graffiti, the most prevalent is “hip hop”, of which there are 3 types: tagging (single colour, done in a few seconds), throw-up (2 colour) and “piece” (multi-colour, 3 dimensional). Less prevalent categories include gang and hate crime graffiti. 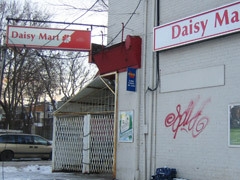 Since graffiti can be done in a few seconds, persons are rarely caught; during the past year, the police charged only 18 persons for graffiti in 51 Division. Widespread graffiti in Corktown is a relatively recent phenomenon, unlike the entrenched “street art” of Queen West. If citizens see persons in the act of creating graffiti, that activity can be reported to 911. After the fact, the property owner can also report the graffiti to the police. Inspector Kuck observed that a building which already has a few graffiti tags will quickly attract more graffiti; whereas a surface kept totally clean of graffiti is less likely to be tagged. This entry was posted in crime, policing. Bookmark the permalink.